This method is so simple and easy that you will be amazed to see the result. You don't have to Deposit or withdraw money via bank wire. All you need is simple documents mention below. 1. First of all scan your National Identity card from both sides OR Single side as seen in picture mention below. Please note that you National Identity card should not be expired and all the corners of your card should be clearly visible. Both English and Urdu language cards are acceptable. 2. After scanning the National Identity card from both sides you have to merge both these cards into one picture. For this you can take help of Photoshop or Microsoft Paint and the end result should be look like this. 3. Now you need a one scan copy of Suigas, Electricity or Telephone bill(PTCL BILL) in order to verify your address. 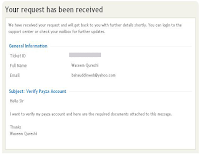 Of course bill name should method with the name given in your Payza account. You cannot change your name in your account so either you have to open a new account or you have to provide the bill with your name. Also please note that bill address should be perfectly matched with the address given in your Payza account. If its not they will reject your application. You can always change address in your Payza account easily by editing the profile settings. Bill should be latest and within from last 3 months. And select the "My Account Support" link from the page. After that select "Account Verification Inquiries" and click next button. 5. You should see a form with some fields like your name, email address and message. Just fill in the details and write in the message box that I want to verify my account and here are the required documents. 6. After filling the form fields just click on Upload link(add File) at the bottom of the page and it will show you the Browse button. Click on it and select your ID card scan copy. 7. Again click on Upload link(add File) in order to upload the scan bill copy. 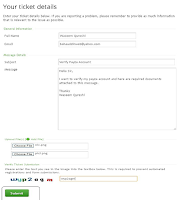 Enter the Captcha code and click submit button i order to upload your documents. 8. It will take some time to upload your documents so please be patient and don't click the button twice. After that it will display the verification message and you should also receive confirmation email on your email address. After that they will take 5 to 6 business days and your account will be verified.